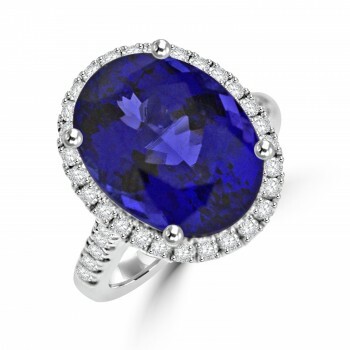 Weighing over ten carats, this dreamy Tanzanite needs to be seen to be believed! The Platinum setting contrasts these violet-blue tones with fine diamond brilliance, surrounding the coloured stone and continuing down the shoulders. A stunning, natural stone in a flattering diamond setting.